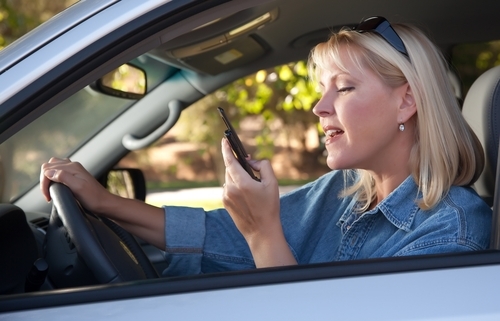 New rules are in place and in effect for Oregon motorists that govern distracted driving. With October’s arrival and the temperatures, season and leaves changing, Oregon safety officials are hopeful that a newly revised traffic law – set to go into effect Oct. 1 – will result in a change in behavior on area roadways. The Beaver State has long been among the 47 states with an outright ban on drivers texting behind the wheel, but with the state legislature passing House Bill 2597 – subsequently signed into law by Gov. Kate Brown – stricter rules are in place designed to incentivize motorists to put down their phones whenever they’re driving. “If we can reduce just one distracted driver accident with this legislation in place, it will be a success,” said Scott Sherbourne, sales director of personal lines at PayneWest Insurance. The update to the existing distracted driving law stems from misinterpretations to the previous one. The original legislative measure expressly stated motorists could only make phone calls on the roads if the devices they are using have hands-free capability. However, the specificity of this provision left out other tools smartphone users frequently have on their devices, such as internet browsers and mobile games. With the latest alteration to the legislation, any function on a wireless devices that requires drivers’ handheld manipulation is now prohibited, including sending and receiving emails, watching online video clips and utilizing navigation-related functions like GPS. Sherbourne noted how in addition to the insurance industry, wireless communications companies and cell phone providers are encouraging responsible mobile device usage with software improvements. Even though just about every state in the U.S. has legislation in place designed to discourage motorists from multitasking, it remains one of the leading causes of deadly car accidents. According to the National Highway Traffic Safety Administration, nearly 3,480 people in the U.S. were killed in highway accidents caused by distractions in 2015, the most recent year in which figures for 12 months are available. Additionally, an estimate 391,000 people were injured in these incidents. The data is similarly grim for Oregon specifically. In 2014, roughly 4,000 crashes were related to distractions, according to the Oregon Department of Transportation. However, as state government officials point out, this figure is likely higher because it’s based on self-reporting. In other words, some drivers may be reluctant to admit their accidents were influenced by inattention. Several studies have all corroborated the risks motorists take when they operate their smartphones behind the wheel. Indeed, ODOT’s Distracted Driving Task Force found motorists who talk on a handheld phone are four times more likely to be involved in a crash versus those who don’t, while texters increase their crash risk 23 times. In addition to an expansion of the already existing distracted driving law, penalties are harsher for violators. As noted by the Portland Tribune, fines can range between $130 and $1,000 for first-time offenders, while repeat offenders can be hit with a fine that’s a minimum of $220 to maximum of $2,500. It may also result in a Class B misdemeanor. All this being said, there are a handful of exceptions that enable motorists to use wireless technology. Lieutenant Timothy Tannenbaum of the Washington County Sheriff’s Office says this includes the speaker function on mobile devices. “You can have a conversation while [your phone] is on your dashboard, or on the seat next to you, as long as you’re not having to type in numbers or manipulate the phone,” Tannenbaum explained to the Tribune. Similarly, according to Michael Berland, patrol sergeant for the Oregon State Police, motorists can touch a button to activate or deactivate a GPS route, provided the device is not physically in their hands. A smartphone that’s positioned in a dashboard mount, for example, would be allowable. Lengthy interaction with technology, on the other hand, requires drivers to pull over or input desired functions prior to pulling out into traffic. The stiffer, more comprehensive distracted driving rules should come as good news to the thousands of Oregonians who are uncomfortable with the frequency in which local motorists flout the law. Nearly 85 percent of respondents in a recent ODOT survey said they felt uneasy when traveling in a car piloted by someone multitasking. Interestingly, however, 75 percent confess to having driven distracted when by themselves. Here at PayneWest Insurance, we believe nothing is more important than the safety of our policyholders. And those who help make the roads a safer place deserve to be rewarded. Safe drivers may be able to save on premiums by maintaining a clean accident track record.